Over the years we’ve watched GPS fleet and asset tracking become the beaten path to IoT-enabled transformation. But as of this writing machine learning is blazing a new trail that could mean the difference between using real-time data to see what’s happening now and predicting what may happen in the future. With this guide you will make the leap from retrospective data analysis to streaming real-time data to predictive data analytics. But it’s up to you as an operations manager to match your use-case with the correct data points and context. Becoming context-aware will enable your organization to cut through the data noise and glean actionable insights. The main way to contextualize telematics data in this fashion is to know more about the vehicles and assets you own and operate. Your GPS tracking solution needs to track more data than the average system, and integrate with other data sources such as CRM (customer relationship management), EAM (Enterprise Asset Management) software, computerized maintenance management systems (CMMS), and fuel card systems. As a result of this interoperability, you’ll gain improved preventive maintenance adherence, faster response to asset health anomalies, actual fuel consumption and efficiency tracking, utilization tracking and prediction, and accurate historical and forecasted maintenance cost metrics. Similarly, the best way to contextualize GPS tracking data for field service operations is to know more about where your technicians and assets should be, and not just where they are in the here and now. A fleet tracking solution integrated with existing field service or CRM systems should yield automated service verification (i.e. verify sales or field workers have serviced a specific account), improved territory management and appointment / order planning, automatic geofence creation, analysis of service verification compared with business metrics (e.g. close sales, customer satisfaction, and first-time fix rates). That’s a question that reaches for a subjective answer to the asker’s problem. In other words, if it doesn’t solve your problem, it’s not a good solution. Choosing a solution with the right hardware, connectivity, applications, integration, security, intelligence, agility, and scalability is the corner stone to real-time data and analytics. Also, knowing how to break down silos and create true insight will become increasingly important as you add more IoT applications to your ecosystem. We appreciate you taking time to read this guide and wish you the best of luck with your IoT implementation. 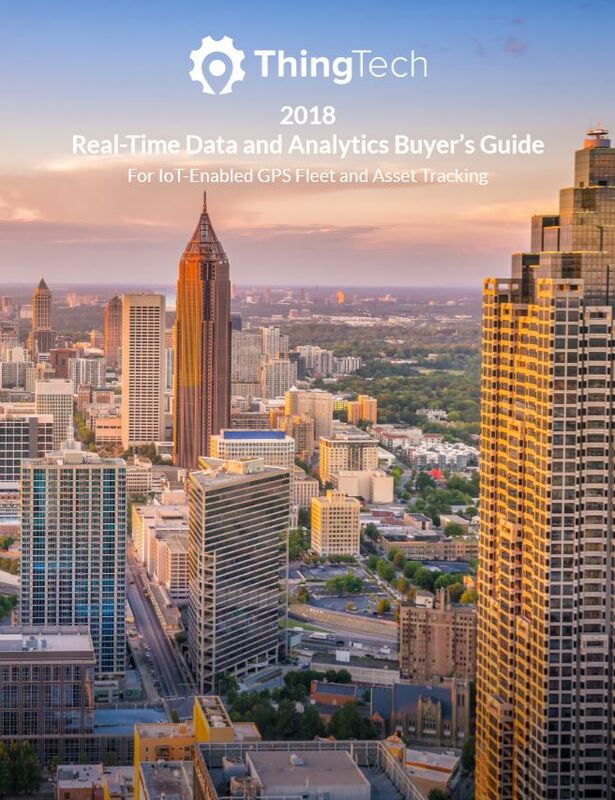 Download our 2018 Buyer’s Guide: Real-Time Data & Analytics for GPS Fleet and Asset Tracking today. Fleeting Moments in IoT: Part 3, What Happens Next?